Devotees of Baba Chamliyal on Pakistani side, held back by a white rope. The fragmentation of the subcontinent into the two countries of India and Pakistan was the worst implication of the end of the colonial rule. The boundary line that was drawn between the two created a new problem in form of ‘border tension’ for both India and Pakistan. Because of the continuous hostility between the two, the border areas were militarised and it impacted the lives of the common people. But the border between the two countries remains as a reality that people cannot overcome. However, the perception of the state and of the people vis-à-vis border does not remain the same. While the state sees the border from the perspective of its security, the people see it as a line that divides the people. However, there are certain exceptional times and places where the perceptional gap between the state and the people gets to be totally covered. The annual festival of shrine of Baba Chamliyal represents one of those times and places. At a distance of 42 kilometres from Jammu city, the shrine falls in the Ramgarh sector on the International Border (IB). Like all other borders, the border in the Ramgarh sector has remained quite volatile throughout the post-1947 period. People living close to it have experienced the bombing, shelling and firing that is a normal phenomenon in the border. They have also had the experience of the various wars between India and Pakistan. However, despite these hostilities and problems which the people experienced because of the border, there was another story of the same border. This was the story of the border becoming a symbol of peace, a place where, rather than hostilities, the common faith would bring the two countries together, year after year, during the mela Chamliyal (the fair of Chamliyal). Held on the last Thursday of every June, the fair became an occasion when rather than the guns, the common faith in the Baba brought the people and even the forces together. The people of J&K are associated with shrine culture for a long time. It is known that some of the localities of the Jammu region are named after the names of Sufis. The Peer Mitha and Lakhdatta Bazar localities are known to have been founded during the medieval period with the settlement of Peer Mitha and Lakhdatta Peer. With the formation of the J&K state in 1846 a special emphasis was given on the preservation of the shrines of the state. The Dogra Maharajas of the state, starting from Maharaja Gulab Singh (1846–57) to Maharaja Hari Singh (1926–47), patronised the shrines. Most of the shrines of the Jammu region received financial assistance from the rulers to carry on their activities for the devotees. The common people of J&K treated these shrines as the places of their shared culture. Baba Chamliyal Shrine, situated on the border of India and Pakistan, of Samba district of J&K state is a living example of people’s recognition of diverse cultures. As far as the life history of Baba Chamliyal is concerned, no literary source is available. Even the oral traditions do not reveal the exact period of the life and times of Baba Chamliyal. But as per common belief, the Baba’s story can be traced to more than three centuries back. As everyone associated with the shrine informs, the shrine is around 320 years old. The residents of the neighbouring villages of the shrine refer to Baba Chamliyal as a saint whose activities accelerated the process of the social development in the area. The story of the life and works of the Baba have been maintained through oral tradition. A Pakistani Ranger shakes hand with BSF officer at Chamliyal. According to the oral tradition of the area, Baba Chamliyal’s real name was Baba Dalip Singh Manhas. He was a saintly person who lived in the village called Chamliyal. As per one story, he used to give drinking water to thirsty travellers. According to other stories, he used to work for the welfare of the needy and talked about universal brotherhood. It was because of his good deeds that he became very popular among people. However, his popularity was not acceptable to a few people who hatched a conspiracy against the Baba and killed him at the Saidawali village, now situated in Pakistan. The head of Baba Dalip Singh fell far away from the place of his assassination, whereas the rest of his body remained at Saidawali. The people decided to keep the philosophy and practices of the Baba alive by constructing his memorials on the border of India and Pakistan. After the death of the Baba, the people of the area constructed two shrines in his name. One shrine was made at the place where his head was fell, now known as Chamliyal, near Dug village of the Vijaypur (Samba). Another shrine of the Baba was made at Saidawali, now situated in Pakistan. Interestingly, both Hindus and Muslims have constructed their own stories about the Baba and his death. While Hindus claim that the Baba was born Hindu and therefore is a Hindu saint, many Muslims argue that he was a Muslim. However, for many, the religion of the Baba is not important. What is important is that they have faith in him. The shrine is also known as dargah in local parlance. The performance of rituals within the shrine is on the line of other dargahs, for instance, the offering of chadar. The people of the area ascribe some miracles to the Baba. One of such miracles is associated with the Baba’s power to cure people suffering from skin disease. According to an oral tradition, one of the followers of the Baba was suffering from some skin disease which could not be cured with the application of the usual medication. One day the Baba appeared in his dream and told him to apply soil, popularly known as shakar, and water, known as sharbat, on his body for some days. When the follower used the prescription of the Baba he was completely cured. From that time onwards the Baba became famous as Baba Chamliyal. Another oral tradition tells that one day an injured camel reached and fell there. It was bleeding miserably and was unable to get up. It was also suffering from hunger and thirst for many days. To quench its thirst it used to eat wet soil. But after some days it was cured and reached the house of its master. The story of the recovery of the injured camel with the blessing of the Baba spread fast and now the local people narrate it before the devotees coming from outside. Although the shrine is visited by people daily, on Thursday of every week it is visited by the people as a matter of faith. At the time of their visits to the shrines the devotees follow the well-defined rules and regulations of the shrine. According to these rules and regulations, all the visitors have to keep their shoes outside the premises of the shrine. Similarly, they have to keep all their belongings made of leather outside the shrine. The organisation of a Langar or open and free kitchen is a regular activity of the shrine. According to this practice, all devotees are provided free food by the management committee of the shrine. The food that is served here is vegetarian. The organisation of urs (death anniversary of the Baba) annually is a regular feature of the shrine. 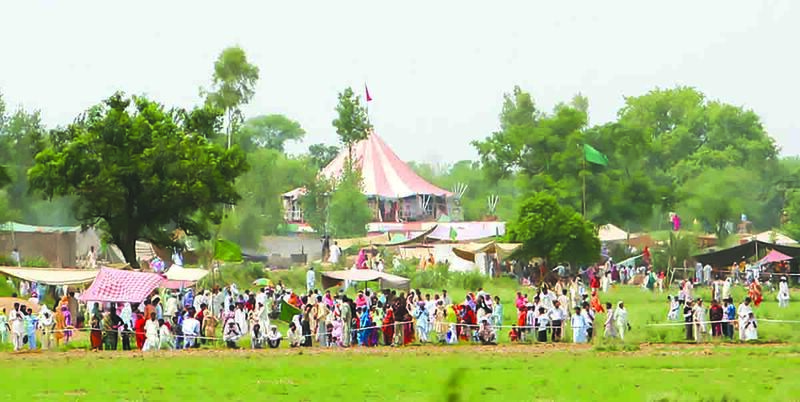 A huge mela is held in the month of June every year. When the devotees come to the shrine of Baba Chamliyal they take a parikarma (circumbulation) of the shrine and touch the chadar as part of the rituals of the shrine. The colour of the chadar is green. Both the shrine and chadar are greatly respected by the people and treated as complimentary to each other. The chadar is treated as a common heritage of devotees of the shrine of the Baba. For the devotees, the chadar is a symbol of the Baba’s identity which is a matter of celebration. The devotees come to the shrine to get the blessing of Baba Chamliyal. Some of the devotees pray for the well-being of their children. They bring their children along with themselves to the shrine and conduct parikarma of the shrine and get the chadar touched with their hands. They eat the prasad made available by the management committee of the shrine. The pahalwans (wrestlers) come to the shrine to pray that they become stronger with the blessing of Baba Chamliyal, so that they can become successful wrestlers. However, most of the visitors come for the treatment of their skin diseases. The shakar (soil) and sharbat of Baba Chamliyal’s shrine are said to possess medicinal value and are very effective in curing skin diseases. There are some set rules and regulations for the application of the shakar on the body of the patient suffering from skin diseases. Most of the patients stay there for several days. According to the well-established practice of the shrine, the patients have to apply the soil and water for at least 21 days. But some of the patients who suffer from acute skin diseases stay there for 24. Several rooms are constructed for the purpose of boarding the patients. Both male and female patients are accommodated in different blocks. These are provided free of cost. This facility provides huge relief to the patients. Since most of the patients belong to ordinary background, they utilise this facility joyously. The shrine is important also for people across the border, for both people in India as well as in Pakistan. Its popularity is not only limited to Chamliyal village or Sialkot on the Pakistani side, but much beyond these places. The popularity of the shrine was spread upto Punjab on both the sides and hence people from both the Indian and Pakistani sides of Punjab visit the shrine on each side. The importance of the shrine to both the sides of the border gets clear from the annual fair that is organised in the month of June. When India was portioned in 1947, the tradition of organising the annual fair continued. On the Indian side, the fair would be organised in the Chamliyal shrine and on Pakistan side, the fair would be organised around the shrine situated at Saidanwali in Pakistan. Both the places simultaneously became places of popular gatherings for the celebration of the life and works of the Baba. Both shrines of Baba Chamliyal have become the living traditions of the border areas of the two countries. Hence, in June, two separate fairs are held. While the major activities take place in the Chamliyal side, the people on the Saidanwali side also simultaneously celebrate the occasion. The fair there continues for three days. After the place was bordered and the two villages of Chamliyal and Saidanwali were divided by the IB, the free movement of the people to the two shrines was discontinued. However, because of the popularity of the shrine, the annual fair continued to be organised on both the sides and till quite late people from across the border from the Pakistani side could visit Chamliyal. After the major wars between India and Pakistan in 1965 and 1971, the borders were closed for the common people. However, what remains important is that the practice of the fair continued and what continued was the practice of offering chadar from the Pakistani side and the presentation of shakar and sharbat from the Indian to the Pakistani side. Devotees to offer a chaadar at Baba Chamliyal. The only difference being that rather than the people, now the ritual was continued by the administrators and security forces. Every year since then a new ritual is followed on the day of the fair. The Rangers of Pakistan present chadar, which is offered to the shrine of Baba Chamliyal. The Rangers of Pakistan are also in turn presented the shakar and sharbat of the shrine by the Indian BSF men. The Pakistani Rangers carry these and offer these to the people. The chadar presented by the Pakistani Rangers is kept as a pious material. This ritual involves the following: (1) Early in the morning the BSF and the district officials on the Indian side receive a team of Pakistan Rangers along with members of the Sialkot civil administration and some civilians (depending on the situation – if the situation in the border is tense and hostility between the two side is aggravated, then the civilians may not be a part of the group). (2) The Pakistani Rangers offer chadar at the shrine. (3) There is exchange of sweets between the Pakistani and Indian officials. (4) There is a meeting between the Pakistani and Indian officials. (5) The shakar and sharbat are loaded onto trollies and sent to the Pakistani side. What remains important about the whole ritual is the involvement of Indian and Pakistani border forces as well as administrators and politicians. 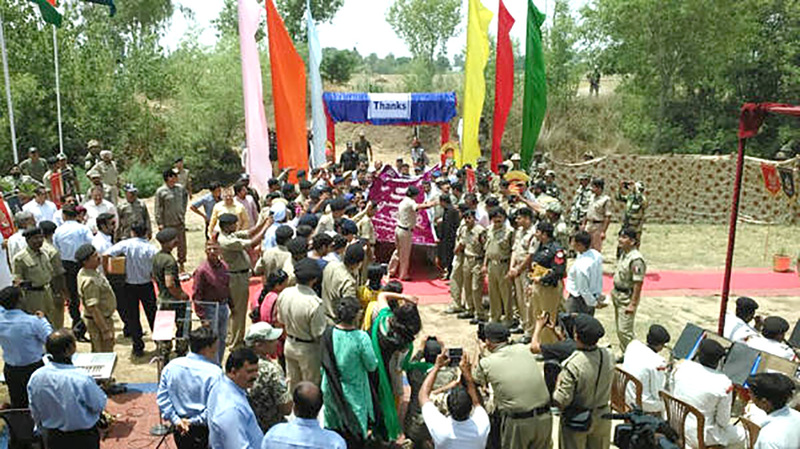 The fair is organised under the supervision of BSF and Pakistani Rangers. The district administration meanwhile organises the fair. The significance of the fair lies in the fact that the ritual of exchange of chadar, shakar and sharbat has continued through the worst periods of hostility between India and Pakistan. During the period of militancy, the fair was organised at low key. But since 2003, the fair is being organised in a very celebrative manner. On both the sides a large number of people participate. During the 2007 fair, it was stated by the officials of the Chenab Rangers on the Pakistani side that ‘at least one lakh people have assembled across the border and were waiting for tabaruk [blessing]’.